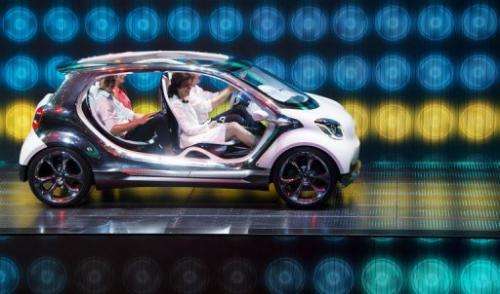 Journalists view BMW's i3 electric car at the Frankfurt Motor Show (IAA) on September 9, 2013. It is BMW's first fully electric model and will have a driving range of 80-186 miles, going on sale in November. 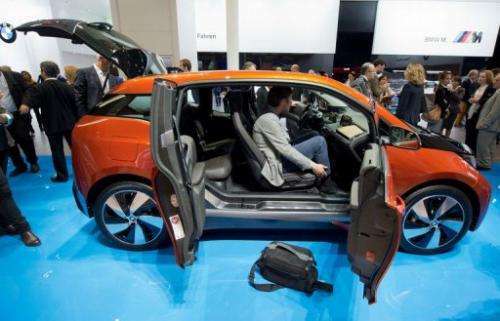 German premium maker BMW has an entire hall to itself where pride of place will be given to the new i3, its first-ever fully electric model with a driving range of between 130-300 kilometres (80-186 miles) which is scheduled to hit Europe's showrooms in November. Another hotly awaited model at the show, opening in Frankfurt on Thursday, will be BMW's plug-in hybrid, the i8. Volkswagen, Europe's biggest car maker, is also going electric with its first fully electric models, the e-Golf and the e-Up!. Mercedes-Benz is looking to draw the crowds with its concept S-Class Coupe and a third version of its A-Class—the compact sports SUV which is a rival to Audi Q3 and the BMW X1. Smart is set to unveil a prototype of its door-less four-seater FourJoy, while Opel is hoping to create a buzz with its Monza concept car, a hybrid intended to lead the way for the brand-new style of the group's upcoming models. SEAT, the Spanish arm of the VW group, will unveil its new Leon ST estate car to be launched in November. And VW's Czech brand Skoda will show off a compact model of its Rapid family car, the Rapid Spaceback. Renault will lift the lid on a new concept car that will prefigure the successor of its Espace mini-van model in the form of a top-of-the-range crossover. The French group's efforts in this field are being closely watched following the failure of its VelSatis and Avantime models. 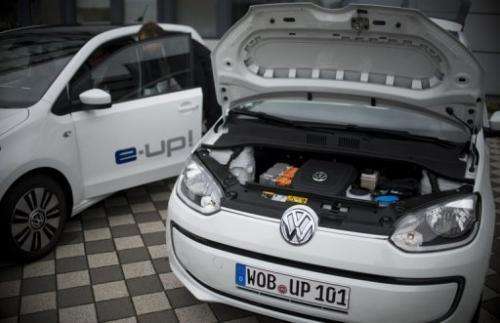 VW e-up! electric cars from German carmaker Volkswagen, on display during a press event on September 4, 2013. The e-up!, which will be on display at Germany's IAA show later this week, will have a price tag of 26,900 euros and goes on sale in Germany in October. Peugeot is coming to Frankfurt with a new version of its 308 that will rival VW's Golf 7. Swedish group Volvo, owned by China's Geely, will show off a concept coupe and Fiat of Italy will lift the veil on its 500X, a crossover version of its 500 model. What's the point? They tried this with the smart crossblade and it didn't sell? What makes them think a similar 4-seater will? Somehow I have trouble understanding how such concepts get past management. Increased focus on electric cars are a step in the right direction, imho. Even if it is still far behind Tesla Motors. I believe that these decisions just adds more fuel to the common misconception that electrical cars are a silly fad, and not a viable form of transportation. Why these electric cars cost so much? Just because they are new? What's the point in it, when the next year a kit to transform a common car to electric will be on the market for less than 2000 euros? They are doing ALL THE POSSIBLE to push the idea that electric is more expensive. For an electric car, less mechanical parts, less components, and yet they set prices to 2-3 times common fuel cars. Yes the batteries are a cost, but still, the whole vehicle costs less than the old petrol car. It looks like the car companies want to push back and back and back the moment electric cars will replace petrol cars. To do so, they keep showing up nice prototypes and expensive vehicles at the shows. The breakthrough will come from do-it-yourself kits, not from car companies. They're trying to recoup development costs which are a lot higher than for the current lineup of gasoline cars (where auto makers mostly just use parts from previous models and give them a new shell). This, in turn, means that there will be a lot more initial unforeseen problems instances of recalling large numbers of vehicles for upgrades. Then there's the lower number of vehicles produced which drives up parts costs. Then there's the new fabrication facilities they needed to construct. All of that has to be factored into the price. But I agree with you. By pricing the cars like they do now they're killingtheir own market. Only the rich can afford one - and the rich don't really give a damn about the environment. They'll just as happily buy a car that gets 10mpg because the cost of gas means nothing to them. Good answer Antialias, the problem is: CAN they see or CAN'T they see what they are doing? If they drop prices, electric cars will boom in 5 years and they will earn back all investments before 10 years. Holding prices up like this is just helping pollution kill citizens. Market is not booming, they are NOT getting their investments back. But because I DO NOT believe they don't know what they are doing, I guess there's the old good conspiracy theory of petrol giants behind this stupid policy. Probably. You have to appreciate , though, how managers think. 10 years (possible) ROI doesn't sound good on the resume of a manager if he can get 3 years (guaranteed) ROI with a gas guzzler. The environmental benefit or long-term image of a company are 'soft values' that don't reflect in their bussines record (and consequently their salary). Making these cars affordable now would seem like a huge risk - and consequently a bad business decision - to them. It's one of the drawbacks of capitalism: Anything outside money doesn't count. 'Polluting citizens' (or not) doesn't make/lose money to a capitalist. So it doesn't figure in any decisions. They are investing on electric vehicles since more than 10 years now. What good can be to keep all these investments hold without selling large volumes? I really can't see it. People are already waiting in line for electric vehicles, they just want them at an appreciable price. You want to tell me that they just watch 3 years in the future? That can't be true, when they invested for years and years in research already. People are already waiting in line for electric vehicles, they just want them at an appreciable price. Consider that you're selling products X and Y (gas and alectric cars for example). Product X already sells well and makes an immense profit (cash cow). Product Y would also sell if you brought it to market - but at a lesser profit. And any unit of Y you sell means one less unit of X you sold. If you do the math on that one it means a net loss for the company. No manager is going to sign off on that. I agree with you... that's sad.